Kibbe's Tomato Pie that I made at home. YUM!! Nearly two years ago when we set off into researching, writing and recipe testing Hello! My Name is Tasty: Global Diner Favorites from Portland's Tasty Restaurants (out August 15th!!) we went on a 10-day Southeastern states road-trip from DC down to Savannah to gather inspiration for the book and get back to chef John Gorham's roots. 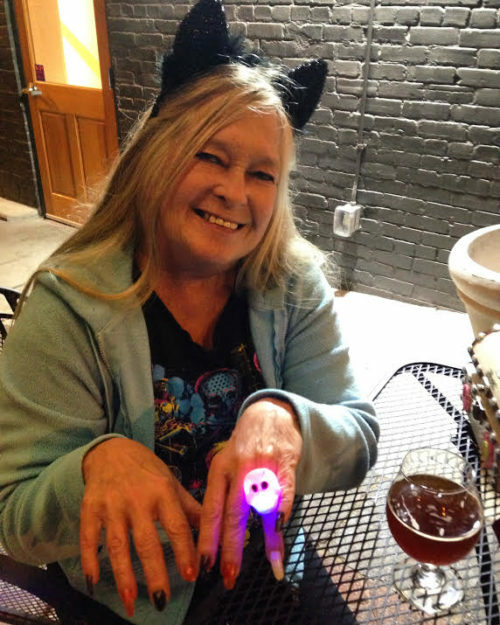 Along the way we had plenty of adventures and met all sorts of sweethearts including Kibbe (whose full name is McKibben Dover Nixon) on Halloween of 2015 at Newgrass Brewing in Shelby, North Carolina. Kibbe has spent all her life in Shelby and at the show she was dressed up as a cat and her son's friend, who she was with, was dressed up as the Big Bad Wolf from Little Red Riding Hood, just after the Wolf had eaten Grandma. It was a super fun night and we talked a bunch about food and cooking and Kibbe told me all about her famous tomato pie. She's been making different versions of this yummy pie for the past 16 years and when we parted ways I asked her how I could get the recipe. She said to email her when I got home and she wrote her email address on the back of a Newgrass coaster. I, of course, ended up writing to her and she ever so sweetly and generously sent me her tomato pie recipe so I'm sharing my tested and edited version of it with you all here. It's tomato time in Portland and if you're at all like me you are going to be eating as many summer tomatoes as humanly possible before the days get short again and those tomato plants get yanked out of the soil. Kibbe uses whatever ground meat she has on hand but typically it will be one part ground meat and one part ground sausage meat. Kibbe also often ups the cheese/mayo mix when she wants to cover the pie entirely with it. If you want to do that just double the cheese and mayo mix below. 1. Preheat the oven to 350 degrees F and remove pie shells from the freezer. 2. Once the oven is preheated and the pie shells are defrosted fork the bottoms of each shell (poking the tines in to them so that you slightly puncture the shell) several times each and bake them for 8 minutes. Remove from oven and set aside. 3. Put the safflower oil into a large pan over medium-high heat and add the ground turkey meat and ground spicy Italian pork sausage and brown the meat, breaking it up and stirring it occasionally as you do so, for 8-10 minutes. 4. Strain the meat from the pan and set aside. 5. Discard any fat from the browned meat and then add the butter to the pan and set the burner to medium heat. Add the chopped onion to the pan and sauté it, stirring it frequently, for 5-8 minutes until it is translucent. 6. In a medium bowl stir together the grated cheddar and mayonnaise into a stiff mix. 7. Evenly distribute the sauteed onions onto the bottom of each pie crust, evenly distribute the browned ground meat next and top the ground meat with a layer of sliced tomatoes. NOTE: The sausage, cheese and mayonnaise all contain a lot of salt and most sausage has a good deal of pepper as well. That’s why we haven’t included any salt and pepper in the recipe. You probably won’t want to add any but give the browned meat a taste and season it if you think the pies will benefit. 8. Sprinkle whatever dried or fresh Italian spices you are using on top of the tomatoes and then evenly distribute heaping spoonfuls of the cheese mayo mix over the tomatoes. 9. Bake the pies in the preheated oven for about 30 minutes and broil them for the last 1-2 minutes so that the cheese slightly browns.